What insurance do owner builders need? Are you planning to build a new home, renovate or extend your present property by yourself? If the answer is yes, then you are classified as an owner builder. The construction must be in accordance with all applicable national and state / territory specific laws and you will need the appropriate insurance to make sure you and anyone else on your worksite are covered in the event of an accident or injury. Who is defined as an owner builder? An owner builder is someone who intends to build a new house or renovate or extend an existing property on their own land without a registered builder. Basically the owner builder acts as the registered builder and thus has the responsibility of supervising the subcontractors. In order to become an approved owner builder you must apply for the required owner builder permit from your respective state. What insurance cover do owner builders need? Public Liability Insurance – covers any third party injury and property damage. Always ask subcontractors for current Contractors Insurance Certificate and ensure they have their own workers compensation insurance. Construction Insurance – mainly for any unforeseeable risks during the construction phase such as vandalism, theft, fire damage, storm, wind or water damage, removal of debris and professional fees. Workers Compensation – this only applies to any workers employed on the site. Personal Accident / Injury Insurance – to ensure the owner builder is covered should they themselves be involved in an accident on site. Voluntary works – if you have family or friends working on the site for free. During renovation, damages or losses can occur, so it is advisable to check your existing structure and home contents policy to ensure your property is covered during the renovation process and make sure you let your broker / insurance company know about your plans. In addition, each state has it’s own requirements for owner builders – make sure you check the requirements for your state. This advice is general only and may not cover everything you require, depending on your circumstances. Ask your adviser for advice specific to your situation if you are considering being an owner builder – visit www.cgu.com.au to find an adviser. PreviousPrevious post:ATA to lead Canberra RSRO protest convoyNextNext post:How does insurance actually work? How does insurance actually work? ATA calls for Government to abolish RSRT now! At Johansen Insurance Brokers Pty Ltd we have been providing general insurance advice and arranging general insurance products on behalf of our clients since October 1970. 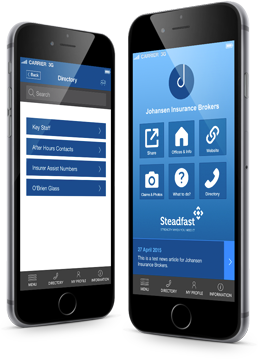 Download the free Johansen Insurance Brokers Brokerapp for useful information and tools when you need to contact us, lodge a claim, or require fast access to your insurance portfolio details. We will be right there for you on your phone, 24/7.